Japan's economy is once again slipping into a deflationary mode as concerns mount about another recession. The nation has become accustomed to "rapid fire" economic downturns and price uncertainty. Bloomberg: - Japan’s consumer prices slid at a faster pace in July and industrial production unexpectedly slumped, raising the danger that the world’s third-largest economy has slipped back into a contraction. The benchmark price gauge, which excludes fresh food, fell 0.3 percent in July from a year before, putting the central bank’s 1 percent inflation goal further from reach, a government report showed in Tokyo. Industrial output fell 1.2 percent. A private measure of manufacturing for August was the lowest since the aftermath of the record March 2011 earthquake. Today’s releases reflect diminishing demand overseas for the nation’s exports amid the European crisis and exchange-rate appreciation, and the end of incentives for vehicle purchases. With Prime Minister Yoshihiko Noda’s government today predicting it will miss a deficit-reduction target, pressure may rise on the Bank of Japan (8301) to expand stimulus and sustain the recovery. 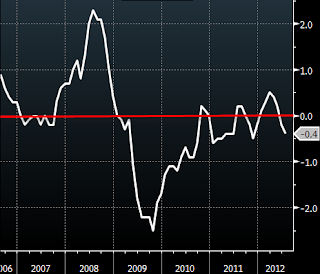 The "core" CPI numbers are also deep in the negative territory. In an attempt to combat deflation and avoid another economic downturn, the Bank of Japan is continuing with an almost perpetual "money printing" policy. 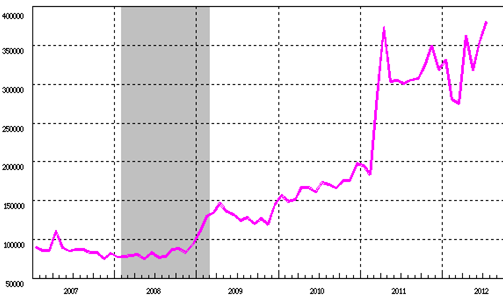 The monetary base recently rose to record levels and is expected to rise again next month (per article above). Weak domestic consumption and stagnant incomes (which will decline as population ages) force Japan to rely on exports. 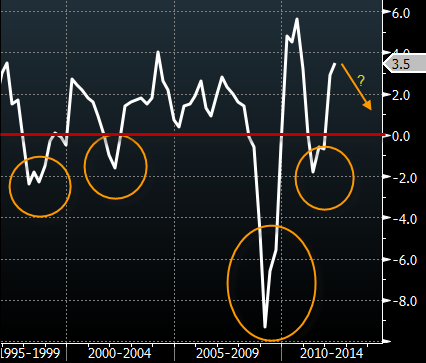 And with a stubbornly strong yen (yen is up some 32% in the past 5 years) as well as weak global demand, export growth is not meeting expectations. BNPParibas: - Real exports fell 1.4% m/m in July, a third straight decline. Exports had been moving sideways since last summer , but the slowdown in the global manufacturing cycle seems to have caused the trend to weaken of late. It's becoming clear that at this stage (similar to the case in the US), the central bank can do little to improve growth in any material way. Raising bank excess reserves further via QE is simply not going to solve the structural issues faced by Japan.